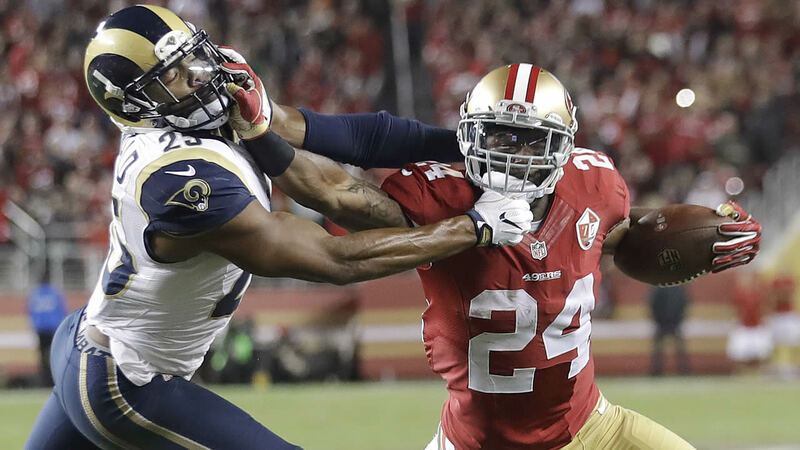 SANTA CLARA, Calif. -- Carlos Hyde ran for 88 yards and two touchdowns and the San Francisco 49ers posted their first season-opening shutout in franchise history to spoil the Rams' first game since moving back to Los Angeles with a 28-0 victory Monday night. Shaun Draughn also ran for a score and Blaine Gabbert threw a touchdown pass to Vance McDonald to help the 49ers win their first game under coach Chip Kelly in convincing fashion. Case Keenum threw for just 130 yards with two interceptions, star running back Todd Gurley was held to 47 yards on 17 carries and the Rams barely even threatened the Niners as they made only 10 first downs all game. San Francisco wasn't much better offensively but managed to run the ball fairly effectively early, leading to the two first-half touchdowns by Hyde and Draughn.